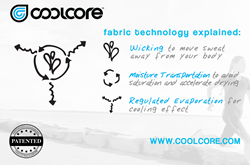 Coolcore, the global leader in chemical-free cooling fabric innovation and creator of Dr. Cool Recovery-On-The-Go™ ice and compression wraps, today announced a significant international expansion, adding new distributors in Asia, Oceana and Latin America. Dr. Cool, the first and only product combining ice and compression in one flexible fabric wrap, has expanded rapidly throughout North America, with over 1,000 retail doors in its first six months after its launch. The strong momentum behind Dr. Cool has been fueled by industry recognition, including being named a finalist in the Future Material Awards “Best Innovation – Sportswear & Outdoor Apparel” category, and consistent media coverage in Men’s Journal, Outside magazine, Real Simple, Self magazine, and the Yoga Journal, among other prominent outlets. The Coolcore fabric innovations used in the Dr. Cool lines are patented and chemical-free, earning the prestigious Hohenstein Institute’s “Innovative Technology” award for “Cooling Power”, becoming the only company globally to receive this honor. Additionally, Coolcore is currently a finalist in the Future Material Awards “Most Innovative Small Company” category. Specifically for 2015, Dr. Cool will launch cooling apparel and accessories globally including sleeves, towels, headwear, wristbands and headbands, as well as shirts and polos.